Despite the injuries, the inconsistent hitting and absent small ball, and the weak bullpen, the Phillies managed a winnning month of May and found themselves right smack in the middle of the NL East race. It was an apparently effective meeting, as the Phillies won seven of their next games and improved to two games over .500. They stumbled by losing the next two series at home to the Red Sox and Nationals and once again were looking up at the .500 mark. That is when the Phillies hit their stride, winning three of four in St. Louis and two of three from the Mets. - Cole Hamels hit Bryce Harper on the first pitch on a Sunday night game and admitted after the game he intentionally hit him and was given a five game suspension. "It's just welcome to the big leagues," said Hamels. - Shane Victorino and Cliff Lee had a near alternation in the dugout during the May 25 game against the Cardinals. - Hector Luna hit a grand slam in his first at-bat with the Phillies on May 16th against the Cubs. - Jake Diekman made his Phillies debut on May 15th in tie game against Houston with two outs in ninth, retired all four batters he faced, and earning the win. - Cole Hamels finished month with 8-1 record and tied for most wins in baseball. - Carlos Ruiz hit .418 with 5 HR and 21 RBIs. The injury bug reared its ugly head again in May, as they placed Lance Nix, Vance Worley, and Roy Halladay on the disabled list. The Phillies lost last night because they only scored one run, not because of Charlie Manuel. The blame falls on an offense that has only scored 16 runs for Cliff Lee all season (that’s just 1.78 per game) and an offense that has zero comebacks after the seventh inning. But, Charlie Manuel is partially at fault for keeping Cliff Lee in the game too long. At that point, Cliff Lee had given up hits to all three batters he faced aside from the one sacrifice attempt. When a pitcher gives up three hits essentially in a row after allowing just two in the previous seven innings, it is generally time to get him out of there. That is especially the case with Cliff Lee. He doesn’t get in trouble often, but when he does it tends to happen quickly. Lee gave up 4+ runs seven times last season and 6+ runs three times. More importantly, Lee got hurt by big innings. He gave up 3+ runs in one inning seven times and 4+ runs 3 times. And need I remind you of Game 2 of the NLDS? On the flip side of the coin, I can’t necessarily blame Charlie for his decision. Should he bring in Papelbon in back to back games for his second 1+ inning save of the week? Does he want to entrust one of Cliff Lee’s few late inning leads to the bullpen? Damned if you do, damned if you don't. Here I am complaining about Charlie's decision, but I might have done the same exact thing. He made a bad choice in hindsight, but it might have turned out even worse if he went to the bullpen. This is a great example of how players get managers fired. If the Phillies scored a few runs there would be no reason to criticize the manager. But, they didn't score runs and that's where the fault lies. Blame the offense, not the manager. 2012 seemed so promising for John Mayberry. After several seasons up and down between the major and minor leagues, Mayberry finally figured it out last year and hit .315 with 10 HR, 25 RBI, a .621 slugging percentage, and a .998 OPS from July 22nd on. He was a reincarnated version of Jayson Werth with a big frame, speed, and athleticism. Stanford educated and the son of a big leaguer, Mayberry had a good head on his shoulders. And he seemed incredibly focused, so much so that he learned Spanish just to understand some of his teammates better. Heading into this season, he gave the Phillies the flexibility to put him at all three outfield positions and first base. That, along with his power potential, made him the perfect candidate to fill the offensive hole created by Ryan Howard's absence. That player has gone completely missing. The Phillies are stuck with John Maybuggles, a player who doesn’t slightly resemble John Mayberry. Maybuggles is struggling at the plate, we all know that. If it weren’t for injuries and a weak Phillies offense, his .225 average might have already pushed Maybuggles into a life sentence in the minors. Knowing fully well that his career is on the line, he should be doing anything in his power to prove to his manager that he belongs. Yet Maybuggles continues to give Charlie reasons NOT to play him. Maybuggles has made one careless mistake after another in the field, on the base paths, and at the dish. Let’s begin with his defense mistakes. Two of them are easy because they occurred at first base in the last two games. On both plays, he failed to get in front of the ball, sending one of a few bad messages to his manager: he was afraid to put his body in front of the ball, doesn’t understand the fundamentals of fielding grounders, was too lazy to get over, or just was not paying attention. Or, even worse, maybe he is a bad first baseman. The problem isn’t that the balls slipped past him. The problem is that with his entire baseball career hanging by a thread, Maybuggles should take a ball in the face to show his manager he wants to be here, yet he instead takes the ball to the side. Good old Uncle Charlie might be the only hope towards finding the old John Mayberry. Charlie knows hitting and he knows people. John clearly needs some help from Charlie the hitting coach, but he might need help from Charlie the mentor even more. Manuel is a master at getting the most from his players. Preaching a positive message, maybe Charlie can give some swagger back to Mayberry. Charlie said yesterday that the Phillies "don't scare nobody." One way to scare the heck out of opposing teams is to plop last year's Mayberry in the middle of the lineup. Add to that a healthy Ryan Howard and Chase Utley and the Phillies could once again scare the rest of the league. Eric Pettis is accustomed to facing challenges. As a 35th round draft pick in 2010 by the Phillies out of UC Irvine, Pettis quickly proved he belonged with an 8-0 record and 1.37 ERA in his first season at Williamsport. In 2011, Eric moved up to Lakewood and later to Clearwater, posting a career minor league record of 10-3 with a 2.17 ERA. With such solid numbers, it came as a big surprise when the Phillies recently released the 23-year-old. Pettis is clearly not averse to roadblocks like the one he currently faces, as he already took on the challenge of becoming an author and published his first book, Just a Minor Perspective: Through the Eyes of a Minor League Rookie. His book chronicles his his first year of minor league ball at Williamsport. He brings to life the seldom examined minor league experience in a way few have. Pettis invites us inside his head through the exciting, frightening, and oftentimes mundane life of a minor leaguer. We travel alongside the right-hander to experience the surreal world of hotels, bus rides, and bright lights. His frank and candid perspective allows readers to experience his feelings, thoughts, and emotions as if they were our own. Pettis allows us to stand beside him on the mound through his attempt to live out the American Dream. We were lucky enough to get Eric to answer a few questions to expand on the book and update us on his status. Before you leave, don't forget to buy a copy of his book. Let's start with the bad news that you were released by the Phillies organization at the beginning of the season. How did you find out and what was your reaction? On one of the last days Spring Training I was brought into the front office and told that the Phillies were no longer in need of my services. I was in utter shock. In fact, I think I gave out a little chuckle when I first found out. I wasn’t angry, I just couldn’t believe that this was the decision that they had come to. I think a lot of people that follow the Phillies system closely felt the same way. With a career 2.17 ERA in the minors, there must be interest from other organizations. What happens now? Any idea how long before you join a new team? Right now it’s just a waiting game. My decision not to go the Independent ball route has, quite honestly, reduced my chances of getting picked up by another affiliated club. But I am content with that decision and am beginning to explore other options in my life. If I end up getting a call then that’s great and I still believe that I am a Major Leaguer. If I don’t, then that's ok too. What have you been up to in the meantime? How have you been preparing yourself to be ready when you finally do get that call? On the baseball side of things, I have been working out every day, staying in shape, and throwing every now and then. I have been promoting my book, scouring the job market, and studying to take the LSAT later this month. Let's shift our focus now to your other career as an author. How did the book come alive and what was involved in putting it all together? From the time I entered the minors I have been writing a blog about my experiences. This past off season I decided that it would be fun to combine everything that happened during my first season into a complete narrative. I wrote the whole thing in two months, sent it off to my family and friends to edit it, and then self-published it to the ebook format. It was a great learning experience and a great sense of accomplishment when it was done. What I enjoyed most about the book was getting inside the head of a minor leaguer. What do you hope fans take away from the book? I really want fans to feel like they were experiencing what I experienced in my first year. Making the transition from amateur to professional baseball is such a new, exciting, awkward, and challenging time. If readers can get just a little taste of that, then I’ve done my job. Your book covers your first season with the Phillies' Class A short season affiliate in Williamsport. Since then you've moved up to Lakewood (class A) and Clearwater (class A advanced). Have you noticed a difference in talent? Yes. There is a definite jump in talent each level. If you are not adapting as a player from level to level and from game to game then you will get passed by. While each level might not be more difficult, per se, it certainly forces you to become a smarter, more consistent player that minimizes your worst and maximizes your best. As minor leaguer, your main concern is obviously just getting to the big leagues. How much did you pay attention to the major league Phillies team? You pay less attention than you’d think. Most of the time you are playing games at the same time as the big club so it’s hard to watch a lot of games. But I’d check the box score occasionally. Honestly, I found myself a lot more concerned with the team that was the level above me. Your goal is to make it to the big leagues, but your not going to make the jump from A-ball. Taking that next step up was always my main concern. You had a chance to play in a few Spring Training games with the Phillies. What was that like? Did any players leave a lasting impression on you? Playing in those Spring Training games was my best experience with the Phillies. Just to get a chance to mingle with guys who have made it where I want to was a real privilege. It showed me that up there nothing is really that different. It gave me confidence that I can get to that level. As far as players leaving a lasting impression, Ryan Madson was by far the best guy to interact with when I was there. Finally, how would you summarize your entire minor league experience? My minor league experience was one of many lessons. Lessons about baseball, about life, about myself. The Phillies have the sixth ranked pitching staff and seventh ranked offense in the league, yet they are the 11th best team in the NL. Having scored just one less run than they have allowed should put the Phillies right around .500, yet they are four games under the .500 mark. The blame must go to the offense, right? I know they have an average offense on paper, but there is no way those runs are scoring when they matter. That's what I thought when I originally titled this article, “Phillies Offense is a hollow bat.” Unfortunately, the statistics refused to cooperate. The Phillies offense is a nauseating and infuriating squad with the patience of a puppy and the discipline of a toddler. Proof of that, as Matt Gelb pointed out yesterday, is that the Phillies are historically bad with runners on third and less than two outs. Further evidence of their impatience at the plate lies is the fact that they are the second worst team at drawing walks in the league. Looks can be deceiving as far as production is concerned. Despite their puke-inducing approach, it is results that matter. And, believe it or not, the results thus far show an adequate offense. The Phillies rank third in average, seventh in runs, and eighth in OBP, which is about as average as it gets. Give this average offense last year’s pitching staff and we might be looking at another first place team. Yet the Phillies find themselves comfortably in the basement of the NL East. It must be a team of Pat Burrells who manage bunches of hits in 12-0 games and nada in the 2-1 nail biters. How else can you explain Cliff Lee’s winless season? But the numbers simply do not tell that story. Many of the stat sites provide a ton of hitting data in every situation imaginable, making it rather easy to decide if teams vanish in big spots. What we find with the Phillies is that they play essentially the same in clutch and non-clutch situations. Compare the Phillies' overall offensive totals to various situational scenarios and you will see what I mean. Don’t feel the need to study the below tables. A quick glance is all you need. Without delving into the numbers too deeply here, few patterns emerge to point out anything out of the ordinary. We see that the Phillies struggle in extra innings, but that is negated by their success in innings 7-9. They hit best in games decided by more than four runs, but they aren’t exactly under performing in the close games. Average is as average does. It’s uplifting in one sense to find that the Phillies are more clutch than we thought. In another way, it’s actually a bit disappointing. At least when the teams of a few years ago weren’t hitting, we could reasonably expect them to turn it around and get hot at some point. Who from this bunch do you truly expect to heat up? Hector Luna? Mike Fontenot? The offense is doing no more or less than anyone expected entering the season and it’s unreasonable to expect more given the personnel. The offense is doing its job, regardless of how bad they look in the process. If other areas of the team held their weight, the offense wouldn't be much of an issue. If starters begin to hold leads, the bullpen stops hemorrhaging runs, and the defense keeps balls in their gloves, then we can start blaming the offense for untimely hitting. Until then, we may have to content ourselves with an offense of mediocrity. The Phillies bullpen better start closing windows and hiding under desks, because they are now officially in crisis mode. With Roy Halladay and his career 7.02 innings per game getting replaced with Kendrick’s career 5.59 innings per game, the bullpen is starting to get exposed. They are costing the team more and more games as the Phillies fall deeper and deeper in the cellar. Injuries have absolutely decimated the pen and forced the Phillies to steal one reliever after another from Lehigh Valley. Iron Pigs now outnumber Phillies in the bullpen, as five of the Phillies eight relievers are minor league pitchers. Let me repeat that: five of the Phillies eight bullpen arms spent more time in the minors in the last two seasons than in the majors. And the Phillies now have just four relievers on the roster remaining from opening day. Look at the Phillies bullpen on opening day compared to right now. Last night was a terrific example of how injuries have destroyed the Phillies. Kyle Kendrick, who should be pitching out of the bullpen, started for an injured Roy Halladay and gave up 6 runs in 4 innings. He handed the ball to Joe Savery, who gave up 3 runs in 2 innings. Savery gave the ball to Rosenberg, who gave up 2 runs in 0.2 innings. Rosenberg tossed it to Diekman, who walked two batters while recording one out. Then the veteran Chad Qualls with his sparkling 4.68 ERA pitched a perfect ninth. Not exactly the Bridge to Lidge anymore. There isn’t much of a light at the end of the tunnel, either. The Phillies are already five deep in the minors and running out of quality young arms to bring up. Jose Contreras is gone for the year. Michael Stutes has been out nearly all year and has no timetable for his return. Same goes for David Herndon, but who really knew he was gone anyway? With the trading deadline still seven weeks away and most teams in the wild card hunt, the Phillies aren’t likely to find “relief” from outside the organization, either. Until then, time to get comfortable with the names Savery (4.12 ERA), Schwimer (5.56 ERA), Rosenberg (21.60 ERA), and Diekman (4.50 ERA). The 2012 Phillies are a throwback team. Unfortunately, they throw back to the 90’s, a time when the Phillies ranked tenth or worse in fielding percentage in 9 of 10 seasons. The 2012 Phillies have the 13th best fielding percentage in all of baseball. If that number holds up for the rest of the season, it will be their worst fielding percentage since 2006 and only the second time in 14 years they will not finish in the top 10. We have been spoiled as fans to have one of the best defenses in the league for several years now. In the last 13 seasons, the Phillies have finished ninth or better in fielding percentage twelve times, sixth or better eight times, and third or better five times. Freakishly tremendous defense has been the norm for nearly two decades. But good defense is kind of like Mom’s home cooking: you don’t appreciate it when you have it, but you sure miss it when it’s gone. Tough plays made with J-Roll's Hall of Fame glove go largely unnoticed, but we sure as heck notice two errors in a game from both Wigginton and Fontenot. The Phillies demonstrated during their recent 1-9 skid just how important a role defense plays in winning games. During that 10-game stretch the Phillies hit .258, scored 4.1 runs per game, and had a 4.93 earned run average. Certainly not a winning formula, but a difference of less than one run per game does not equate to a 1-9 record. Of course, there is one little item missing from those figures. See, the Phillies committed 12 errors which led to 8 runs. Added to the earned run average, those 8 runs equate to 5.8 runs per game and nearly double the deficit to 1.7 runs per game. We can hope players get better, but Charlie can’t magically make Wigginton, Fontenot, and Luna become gold glove defenders. As with the bullpen, these are the guys we are stuck watching. And for the first time in a decade, Phillies baseball might have to be synonymous with bad defense. A few weeks ago we were visited by the Ghost of Phillies Past who led us on a journey through the best era in Phillies history. “Pat the bat” reminded us of the near misses in 2005 and 2006, the first division title in 14 years, and the second parade down Broad Street in 125 years. We returned to our slumber amid the fuzzy thoughts and comforting memories of a brief slice in time when Philadelphia ruled the baseball world. We are struck by a 35 ounce Louisville Slugger wooden bat and awaken as a piercing, burning sensation overcomes our forehead and we are plunged into the corner wall. Heart racing and head throbbing, we slowly tilt our neck upwards and behold a colossal, bearded figure towering above. "Blackbeard?" we cry out. With no response, the beast turns around, crisscrosses his hands, and points towards the sky, revealing a San Francisco Giants jersey. It’s Brian Wilson. Brian Wilson epitomizes the Phillies present, which in my mind began in 2010, as the Phillies progressed from an overachieving, exciting squad to an under performing team with unmet expectations. Since winning the World Series in 2008, the Phillies have won more games each season and experienced earlier postseason exits. As the regular season wins go up, the postseason wins go down. In this article, we will examine the Phillies recent seasons to determine the current character of the team we see today. 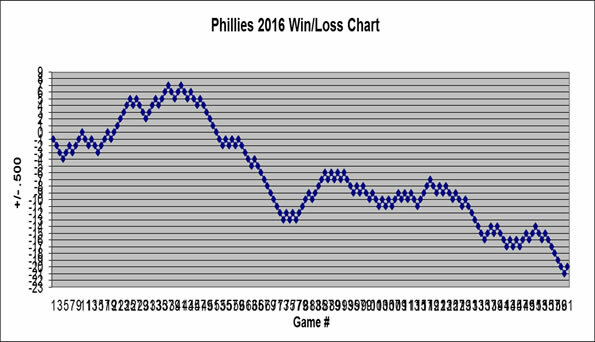 We will begin with the 2010 and 2011 seasons before finishing up with an examination of where the Phillies stand at this very moment. The old saying goes, “pitching and defense win championships,” and the Phillies had an overabundance of both during the last two seasons. The Phillies certainly had championship caliber defense, as they continued over a decade of defensive dominance with MLB's sixth best fielding percentage in 2010 and the best in 2011. The four ace pitchers in Halladay, Hamels, Oswalt, and Lee combined for a 99-50 record and a 2.63 ERA in 2010 and 2011. Consistent starting pitching avoided long losing streaks, especially in 2011 when (ignoring the games after they clinched) the Phillies had just three losing streaks all season of three or more games. As the pitching improved dramatically, the offense slowly declined. After ranking first in the NL in runs and home runs from 2007 - 2009, the Phillies dropped to second and then seventh in runs and dropped to fifth and then eighth in homers. Despite an offense in decline, the pitching + defense formula worked like a charm in the regular season, as the Phils outscored their opponents by an average of 158 runs in 2010 and 2011 versus an average of 100 runs from 2007 - 2009. The problem, obviously, was that regular season success did not equate to postseason glory. In the 2010 playoffs, the pitching was tremendous and posted a 2.26 ERA, but the Phillies hit just .216 and averaged 3.3 runs per game. Everything failed in the 2011 postseason, as the Phillies hit .226 and scored 4.2 runs per game while the team ERA ballooned to 3.89. Most disappointing in 2011 were the blown leads of four runs by Cliff Lee and two runs by Roy Oswalt, both allowing five earned runs each in the process. Two tremendous seasons and two of the best starting staffs known to man fell short both times. ...then it all came tumbling down. It began that fateful October night when Howard crashed to the Citizens Bank carpet on his torn Achilles as the Phillies season came to a close. Then Utley…well…me might never know what is going on with his knee. Despite losing their number three and four hitters, the Phillies were still the preseason favorites in Vegas to win the World Series. Roy Halladay joined Utley and Howard on the DL and $55 million were now missing from the field. Those three had plenty of company - Martinez, Stutes, Lee, Nix, Thome, Worley, and Galvis all joined the DL party; Polanco and Ruiz have missed several days; and Contreras and Herndon are now gone for the season. Injuries have forced bench players like Wigginton, Nix, Pierre, Galvis, Mayberry, Luna, and Fontenot into starting roles (two of which are still on the DL). The bench has performed admirably, but they cannot match the production of the players whom they are replacing. Their defense has also become problematic as they have committed 19 errors in 20 June games and dropped to 15th in fielding percentage. Injuries, bench players, and errors create a bleak and grim scenario for the Fightins, but the hitting has been just good enough to keep the team afloat. It’s actually the pitching that is sinking the ship. Ah... starting pitching, the one area that can cover up all wounds. The Phillies only hope to survive rested on the arms of the three aces. Unfortunately, a staff that dominated the league a year ago and allowed 49 less runs than the next best team now ranks seventh in the league. Without a superior staff, the Phillies are forced to rely on hitting, defense, and relievers, and we've seen how that has worked out. Losing Halladay certainly plays a part, but the bigger problem is that the two ace pitchers behind Roy were unable to step up their game. Cliff Lee is still winless and has blown four leads of two or more runs and three leads of three or more runs. Cole Hamels has a 5.19 ERA in the five games since Halladay hit the DL and his 3.25 ERA is nearly a run higher than it was last year at this point (2.49). Not to mention Joe Blanton and his overall 5.04 ERA and 6.87 ERA in his last five starts. What kills the team more than anything is the bullpen, which ranks 11th in the league with a 4.35 ERA. Injuries played a major role to be sure. Contreras, Stutes, and Herndon all out due to injury forced the Phillies to dig into the minor leagues and now 4 of 7 Phillies are minor leaguers. With big bucks spent on Papelbon (who has been worth every dime), Ruben Amaro had little money left to spend and subsequently “improved” the bullpen with cheap signings like Dontrelle Willis and Chad Qualls. Many of the names and faces from the World Championship team are the same, but they are shells of their former selves. Howard is now 32 and recovering from major surgery. In the last two seasons Utley has missed 106 games and Polanco has missed 70 games. Rollins is hitting .260 versus his career best .296 average in 2007. Victorino is hitting .252 versus his peak of .292 in 2009. The only core starting player that has improved is Carlos Ruiz. You can view all the stats imaginable, but the only numbers that really matter are 5 games below .500 and 9 games back in the NL East. How will story end for the present Philadelphia Phillies team? Will the Phillies become sellers and trade Hamels, Victorino, and possibly others? Will the Phillies finish with a .500 record and begin a trend toward mediocrity? Will they win the Wild Card only to lose in the postseason once again? Or will Utley and Howard save the day and bring a most unexpected championship? Plenty of outcomes are possible, but only the Ghost of Phillies Future knows the answer. Look, up in the sky! It’s a bird, it’s a plane, it’s…Chase Utley. Once upon a time in a land far, far, away, Chase Utley’s return to the Phillies lineup was a joyous occasion. Dan Baker would announce his arrival as Chase would swoop in from beyond the clouds with his blue, cape and red ‘S’ fluttering in the wind behind him before gently landing on the Citizens Bank turf. Utley’s third straight season to return from a prolonged absence was quite possibly his most Superman-esque performance. Even the man of steel would have been proud of Utley’s 2012 debut in which he went 3-for-5 on the evening, hit a home run in his first at-bat, and was retired on a 400-foot fly ball. Utley looked good last night. Real good. His gorgeous, short, stroke reemerged from over eight months of hiding and his legs appeared to have regained their strength. It was like watching the Chase Utley of 2007. But it was not the Chase Utley of 2007. One solid game does not eradicate the realization that the 33-year-old second baseman has missed 135 games due to the same chronic knee issue and 182 games total over the last three seasons. Chase Utley in 2007 would have scoffed at the idea of two days on and one day off. The 2012 version understands he must accept it. Don’t fool yourself into believing the former MVP candidate has fully returned from hibernation. His swing may look good now, but let’s see how his knees handle the wear and tear from the rigors of second base. Don’t forget that his knee did not improve after six months of rest and his situation has placed him on an abbreviated schedule. Let’s just assume, for argument’s sake, that Utley avoids any serious physical setbacks and maintains his schedule of four or five game a week. What does that mean to the Phillies? There’s no question that Chase Utley helps this ball club. It would be hard to imagine Utley hitting worse than the .241 average with five homers and 37 RBI the Phillies have received from second base prior to yesterday. And Utley is no Freddy Galvis, but the hole in his glove cannot be as large as Fontenot’s. If Utley can play, he absolutely helps this team. Prior to last night’s game the only certainties in the Phillies lineup were the first and ninth spots in the lineup. Victorino has hit in six spots in the lineup, Polanco and Mayberry have hit in five spots, Pence and Ruiz have hit in three spots, and Rollins has hit in two spots. The Phillies have had a total of four players bat third in the lineup this season. When Utley starts, the Phillies have much more stability in the lineup and players can regularly bat in more comfortable positions. Pence and Victorino are slightly akin to Andre Iguodala in that they work well as role players, but not as the focal point of an offense. Utley is now the main piece of the offense (although Chooch makes a good case for himself), which must feel like a mountain of weight has been removed from the shoulders of Hunter and Shane. Now they both can slide down to more comfortable spots in the order and, who knows, maybe produce more runs. Utley makes the players around him better, the ultimate sign of a leader. Utley is prepared, aware, and constantly thinking. He religiously watches video, arrives at the park early, runs balls out, goes hard into second, runs the bases with reckless abandon, and plays fundamental baseball. On a team which has been lacking in all areas at times, they can use Utley's lead-by-example approach. He reminded us of those tremendous attributes over the last two days. In Lehigh Valley on Tuesday, Utley arrived more than six hours early and one of the first things he wanted to know from manager Ryne Sandberg was what the signs were. In yesterday's game we saw Utley hustle down the line on a grounder as usual. And during a pitching change when Utley was on base, he quickly ran to the dugout to check the scouting reports on the Pirates outfielders in case he had to test their arms on a play at the plate. Those are only a few examples of a leader. The lineup looks better with Utley batting third. Utley adds a small nugget of fear in opposing pitchers. It feels better to be a Phillies fan with Utley on the team. And, as Charlie Manuel predicted, "I think with Chase coming back, there'll be a different energy in the ballpark and in our clubhouse."